You'll soon be able to physically act out the "console wars" with transforming robots. The "console war" is more of a concept than an actual war with tanks and guns and junk, but Takara Tomy is slowly allowing fans to physically act out the battle of the consoles with new Transformers that transform into consoles. 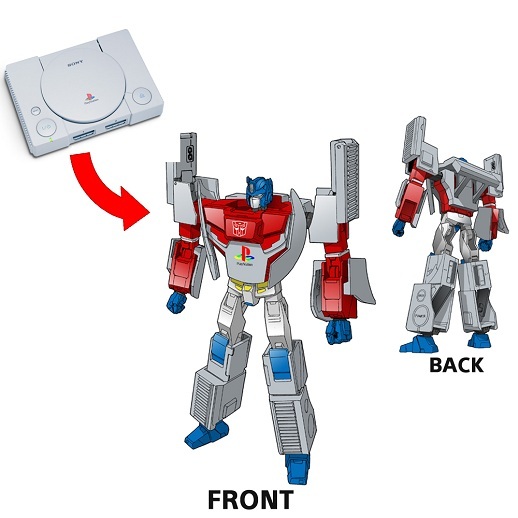 Earlier in the year, we saw the reveal of Megadrive Megatron - a fitting disguise for the deception leader - and now, he finally has an opponent: PlayStation Optimus Prime. The new toy is being released as part of a dual anniversary celebration: 2014 marks the 30 year anniversary of Transformers and the 20 year anniversary of the PlayStation brand. Along with the special Transformer, a series of 1/6 scale toys based on the lineup of PlayStation consoles will also be released for the double anniversary. There's no solid release date for the toys yet, with Takara Tomy stating that they are due for release in early 2015. Megadrive Meagtron, on the other hand, should be hitting stores later this year. There's no word on whether either of these special console Transformers will be released in the West, but hey, that's what Play Asia is for, right?